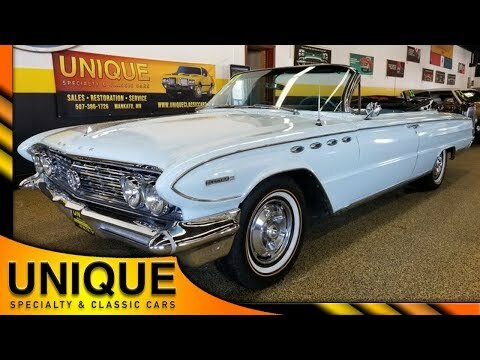 1961 Buick Electra 225 Convertible, Survivor! TRADES? 1961 Buick Electra 225 Convertible that came to us out of long term storage. This is a 2 owner car, and the previous owner absolutely states the 34,000 miles are actual! He purchased from his friend over 25 years ago and has known the car. This one retains the original 401 Nailhead V8 paired with an automatic transmission. Power steering, power brakes, power top, and power windows. Very nicely equipped Buick. Original blue color with white top. Has had 1 repaint along it's lifespan in its original color. Very solid car with original floor pans. AM radio and clock on the dash. Doorcards and carpet are in good shape. Leather bench seats. Brightwork is decent, but if you look at the pictures you can see the rear bumper has a couple of dents, etc. We replaced most of the fuel system, new Edelbrock Carb, new mufflers, exhaust components, new convertible top motor, wheel cylinder, brake hoses, brakes and brake shoes.